The Ministry of the Environment, Conservation and Parks have scheduled a series of information and training sessions to inform stakeholders/licence holders of the important changes that will be taking place with the pesticide licence application process. On Sept. 4, 2018, the application and renewal process for pesticide licences will move from the current paper-based process to an online process. In order to ensure a smooth transition, the Ministry have set up a number of sessions across the province and are inviting you to attend in order to help you get an understanding of what the new process will look like. Currently, there are six sessions planned for exterminator licence holders and six for operator/vendor licence holders. These are online sessions: please bring a laptop/tablet on which you can participate in the training. 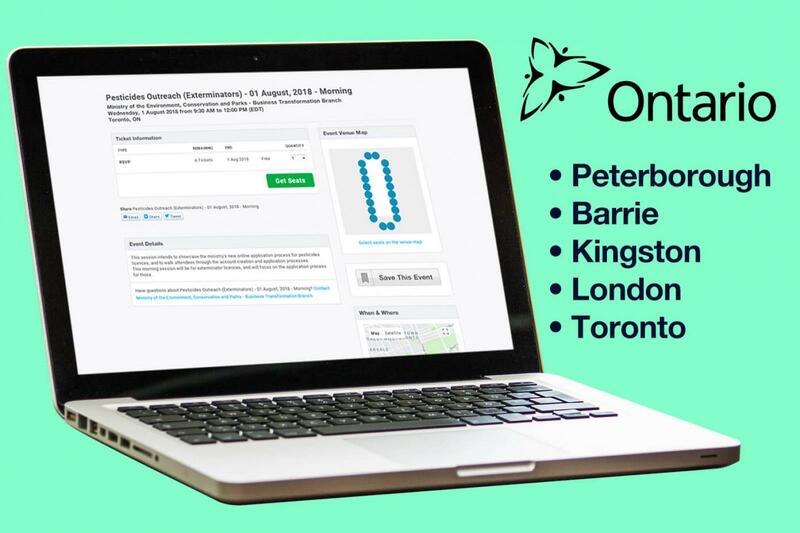 These sessions are taking place in Toronto, Peterborough, Kingston, London, and Barrie. To sign up for any of these sessions, please scroll down to the city in which you would like to attend, click the links next to the RSVP online under each session below. This will open a link to an EventBrite page where you will be able to order your ticket(s). There is no charge to attend a session. If you would like to create an account at the session, you will need to have this information with you. PLEASE NOTE: There is limited seating available for all of these sessions, so please sign up as soon as possible. If demand exceeds capacity, please advise us of your interest and we will attempt to schedule additional sessions in the fall.